From the creators of Diner Dash comes Plantasia, a game of gardening delight. Enter your luscious gardens, where magical flowers and a fairy-in-training are waiting to show you the way. Plant seeds, harvest flowers, restore fountains, and watch as your gardens bloom. But beware! 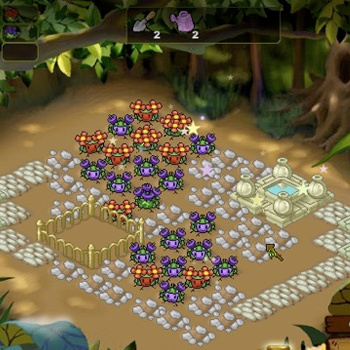 Weeds, rocks, insects and the clock are all waiting to make your game a fun-filled challenge. Plantasia dreams up plants and flowers not seen since Alice fell down the rabbit hole. Restore one fantastical garden after the next, choose your flowers and gardening spells wisely, and discover how a fairy wish unfolds.